We supply paddles and life jackets (if required) for new paddlers free of charge. The supplied paddles are of a standard size and do not suit all body sizes. Therefore, many paddlers, after they have been paddling a while like to purchase a paddle more suited to their body size. A wide range of paddles in a wide range of prices (from $75 - $480+) can be found on the international market, and can be purchased through distributors in Australia. Paddles can be made of timber, carbon-fibre, a combination of both, and fibro. All paddles require proper care and protection if they are to last. Paddle bags are also available from the distributors (and I have seen some beautiful home made bags as well). Some distributors have stalls at State and National regattas and many can be found on the internet (google 'dragonboat paddles Australia'). 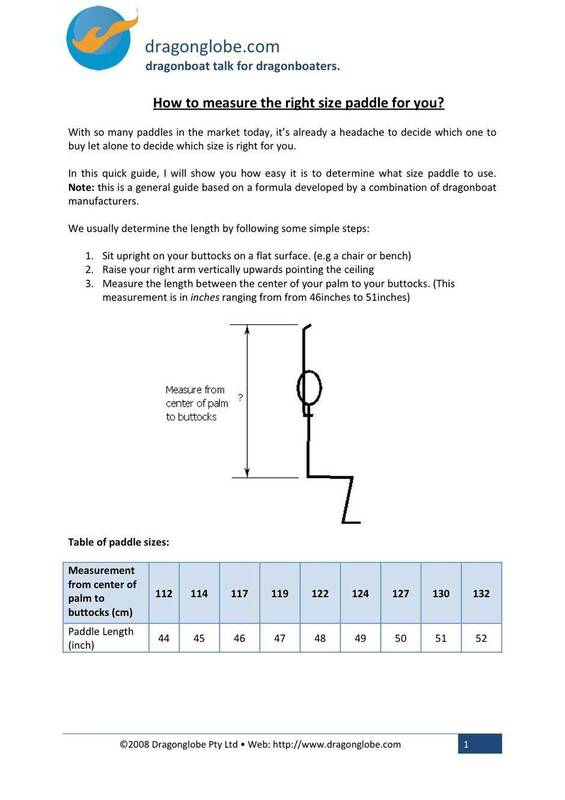 For those thinking of purchasing their own paddle, here is a guide to determining the size that suits you. Sit up very tall and straight when doing this.